While François-Xavier Tourte was perfecting the modern bow, violin making in France was dominated by three makers: Nicolas Lupot, François Pique and Jean-François Aldric. Lupot, the ‘French Stradivari’, stands as the most famous of all. His prominence overshadowed the careers of his contemporaries, and even now his reputation tends to eclipse those who worked closest to him. A great deal is known about Pique’s relationship with Lupot, working first as his agent in Paris and later sharing a workshop. Aldric’s relationship remains more ambiguous, but his style of workmanship is deeply influenced by his contemporaries, and his instruments, which are relatively scarce, are often confused with those of Lupot. These makers were the first generation to embrace the Stradivari model, and developed their style after the virtuoso violinist Giovanni Battista Viotti took Paris’s Concert Spirituel by storm, attributing his success to his Stradivari violin. The relative scarcity of Stradivari violins in France in the early 19th century combined with a sudden increase in demand created the perfect environment for these French makers, who thrived through their adoption of this new fashion. Louis Spohr owned a Lupot and wrote in praise of Pique. Olé Bull played a Pique during a lengthy concert tour, and François-Hippolite Barthelemon, leader of the band of the King’s Theatre (a forgotten star of his age), used a violin by Aldric. 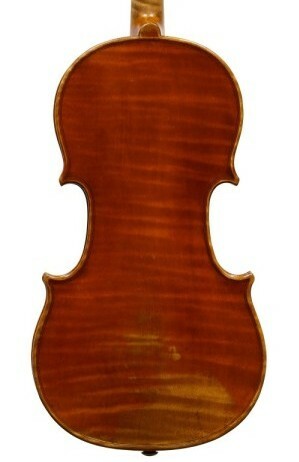 The Aldric violin shown here was made in c. 1815 and is a characteristic example of his work. Overall it is a closely observed interpretation of Stradivari’s work, down to such details as the correct Cremonese pinning on the back. Yet Aldric appears never to have entirely lost the influence of his Mirecourt training, perhaps opting to combine a French aesthetic with that of Stradivari in order to create a more personal model. Hence the edgework is rather heavy, a feature that is common among all three makers. 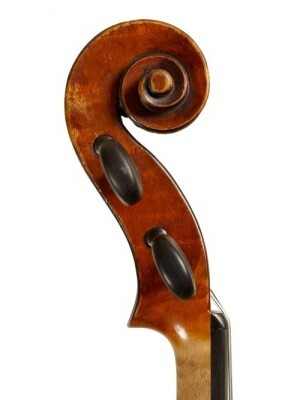 The arching too is bolder than expected for a Stradivari model, creating the upright appearance of the soundholes which distinguishes Aldric’s work. His choice of wood is typical of this group of makers, as is the deep red varnish and the way that it wears off to reveal a strong yellow ground. Aldric’s importance extended beyond his violin making. He was a prolific dealer in Paris and the last of the generation that thrived before the rise of Jean-Baptiste Vuillaume. When Luigi Tarisio made his first visit to Paris in 1827, having heard of the high prices that he could get for his Italian violins, it was to Aldric that he sold his first consignment, thus marking the beginning of one of the most important chapters in the history of the violin.